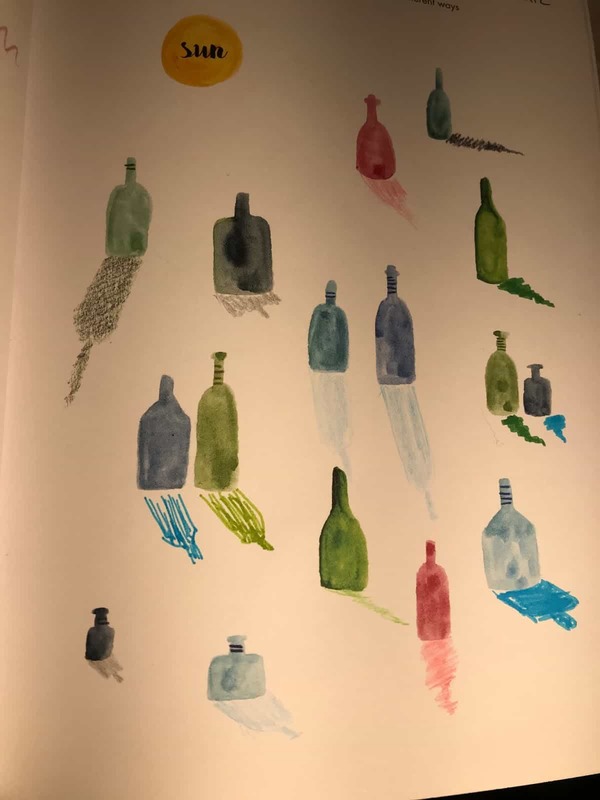 71: Add shadows to the glass bottles. Try different ways of drawing them. I found this one to be fun. Not sure I found a lot of different ways of drawing them. I enjoyed this one too. Did a rather larger design as I had less time than I would have liked, but I found it pretty much fun. 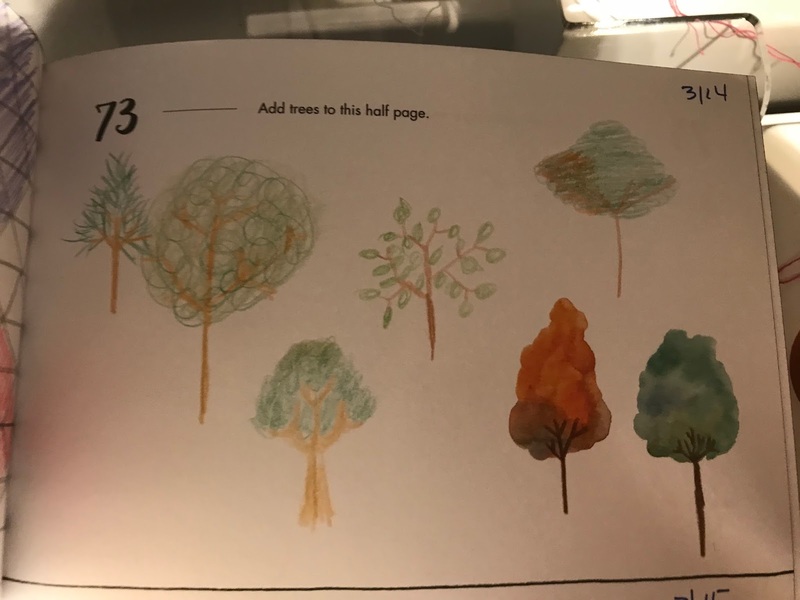 73: Add trees to this half page. I took Sherry’s approach and did the trunks first this time. I liked that better. Good thing it was a sunny day with clouds. The nor’easter this week would have been blank! I really just gave this a passing sketch – very fast and not really dark enough. 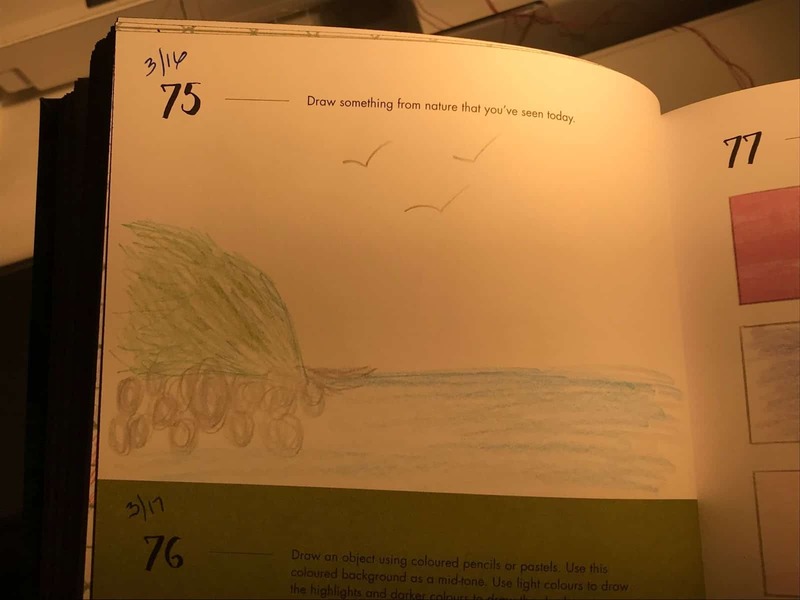 75:Draw something that you have seen today. OK – I did this Sunday not Friday when we were in Maine. A bit of the coastline – I am no Winslow Homer- but I liked doing it. 76. 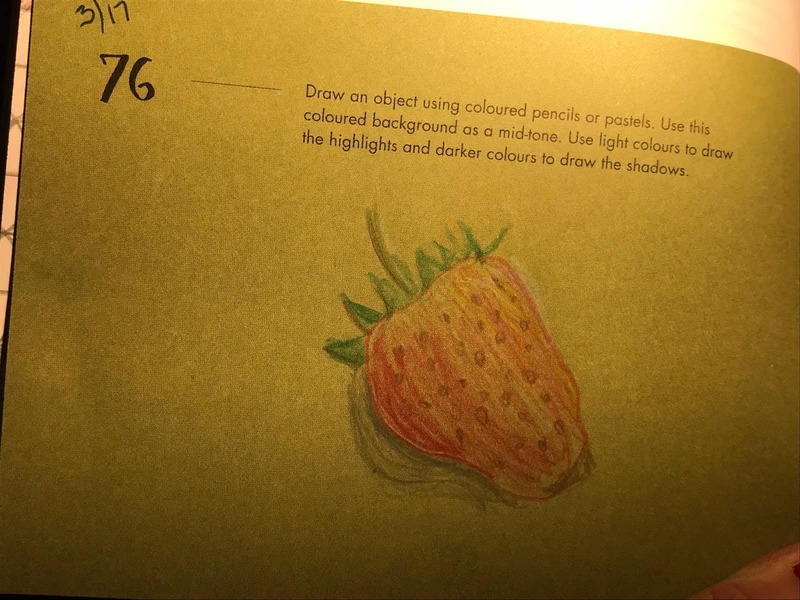 Draw an object using colored pencils. Use the background as a mid-tone. Use light colors to draw the highlights and darker colors to draw the shadows. I did a strawberry. I enjoyed this but the lights were hard to get to work. I think this may be my best work this week. 77: Explore colors that look good together. 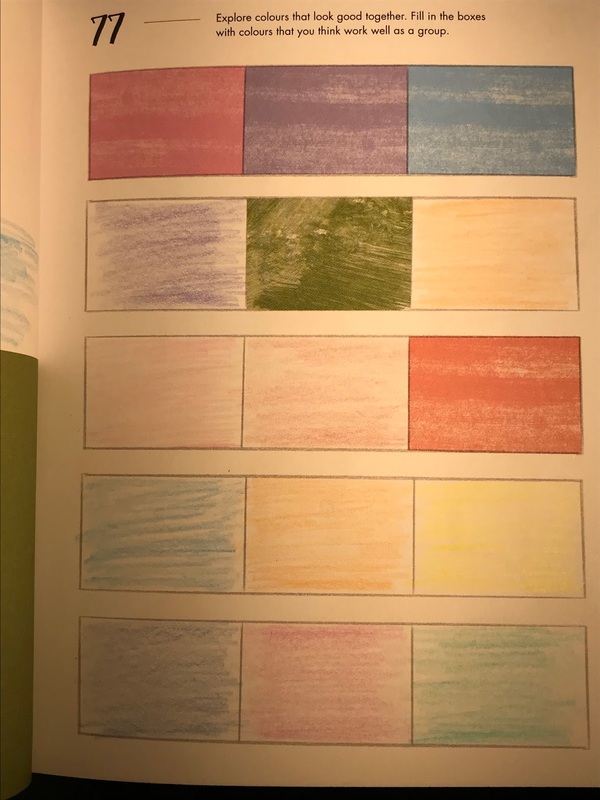 Fill in with colors that work well as a group. Of course, I would like this – whats not to like about working with color for a quilter. All in all, a pretty good week in the drawing world. I do need to take these pictures as I go and in the daylight. My apologies. I worked on quilt with a new technique for my #IslandBatikAmbassador as well as working on my OMG – the loon. I am nearly finished both, so we’ll see which I blog about first! Yup, the winter of our discontent!!! Once again left Maine early due to a Nor'easter coming in. Gheez – they are just not giving up. But, I will have a good day to blog a few things, 2 projects done and a couple on the horizon! I was pretty pleased with that strawberry! 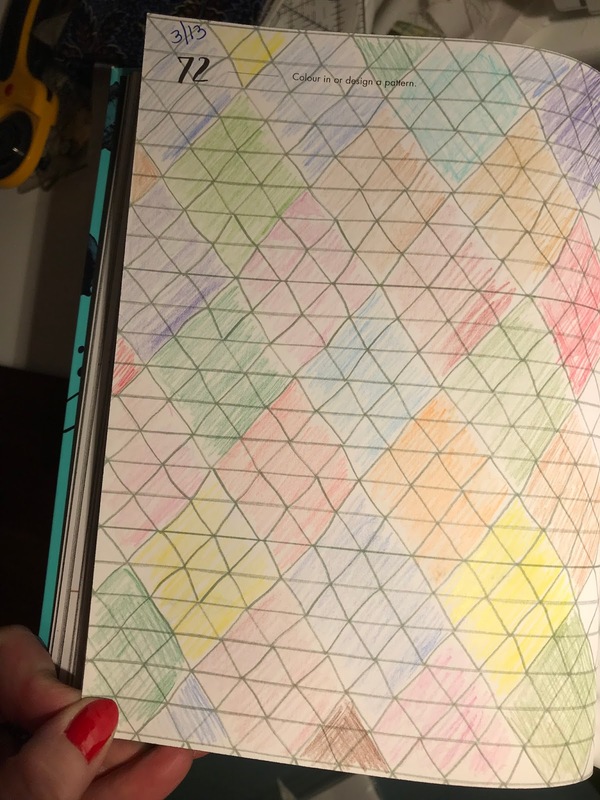 I love seeing what you all are doing with these drawing pages!!! Thanks, Nancy. I have gotten a little delayed here by a major computer meltdown – lost two days so sorry for the late response. I am being a bit easier on myself about them and doing what I want. 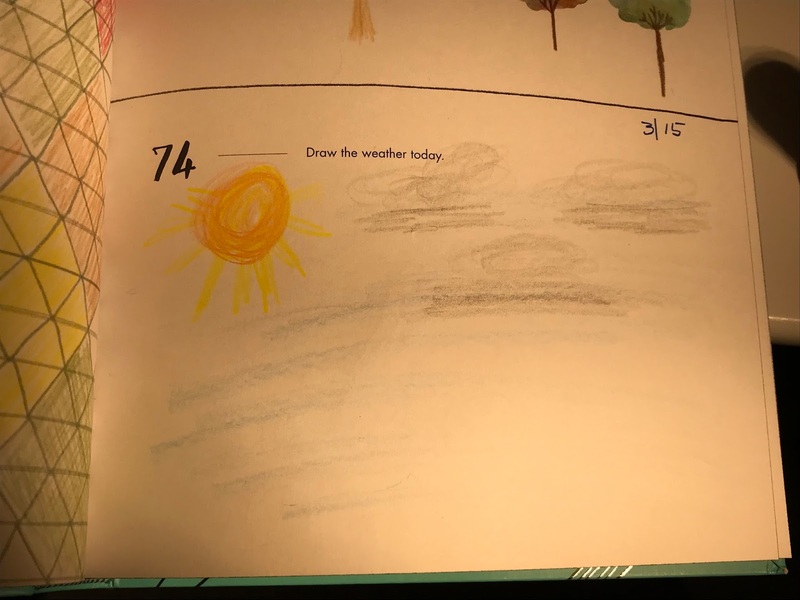 The one week I didn't blog and that is okay by me! I so appreciate your comments and visits.